Real name Marco Togni. An agent of Section 2 and Angelica's handler. 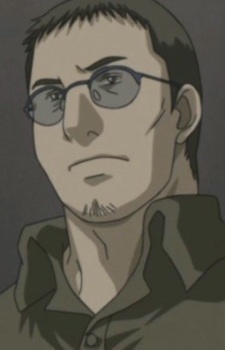 After being suspended from military service due to an injury to his left eye, Marco was recommended by his friend Dr. Bianchi to be the handler of Angelica, the first child assassin of Section 2. While taking care of Angelica, Marco told her stories of "The Prince of the Land of Pasta" a fictional prince who ate only pasta. He spent much time looking for ideas for the story. This fascinated his girlfriend at the time, Patricia, who later wrote and published the storybook "The Prince of the Land of Pasta", a copy of which Marco bought and read for Angelica. As time went on, Marco witnessed Section 2 develop into an effective combat unit and Angelica's tremendous potential as an assassin. Sadly, Angelica also was the first girl to experience the side-effects of the conditioning process, particularly long-term memory loss. Disgusted with the many setbacks that resulted afterwards, Marco felt that any further effort was in vain, and had no desire to continue, and takes an impersonal and critical approach to Angelica's training.